Pre-heat the oven to 180degrees. Arrange the sweet potato and onion on an oven tray, add salt, drizzle with olive oil, cover with foil and bake for 10mins. 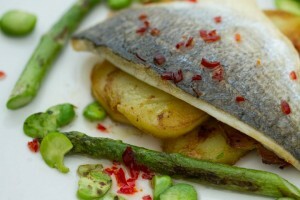 Take the tray out and place the already salted fillets of bream on top of the potatoes and onion. Bake for a further 10-15mins, until the fish and the potatoes cooked. Put a dollop of olive oil in a pan and sautee the garlic and chilli until golden. Take the fish and potatoes out of the oven and place on a serving plate. Drizzle the fish with a tablespoon of white wine vinegar and add the olive oil with the hot garlic and chilli. Enjoy this super delicious and super light dish hot! Mind coach, spiritual healer, warrior queen, The Peruvian Sage brings every day wisdom for the woman warrior. Here you’ll find psychological and spiritual advice and support to help you regain your confidence. Develop the unshakable inner strength and self-belief you need to finally make all your dreams come true, and live the life you deserve.